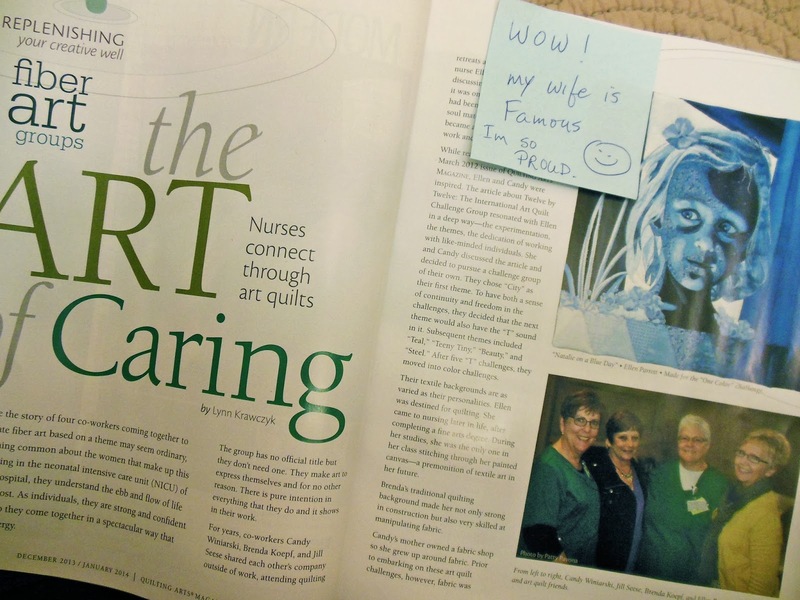 Let me just say that that little post-it note is as much of a keeper as the magazine 🙂 Yes, I’m thrilled that my friends and I are in the magazine with all that exposure for our art, but am I famous? No… only in my husband’s mind! I AM gratified that he’s proud. I feel blessed to have a husband who, although his hobbies run to hunting and the outdoors, happily supports me in my creative life. So now I’m off to the store to buy a couple of extra copies. Natalie will get one to keep with her portrait quilt, of course. I like to think that years from now she’ll view the magazine and quilt as a little legacy from her Grandma, a loving token to pass on to her own daughter or granddaughter. That gives me a lot of satisfaction. Follow this link to Nina-Marie’s “Off The Wall Friday” for some quilting inspiration!